Stone, David (2015). The Russian Army in the Great War: The Eastern Front, 1914-1917. Lawrence: University Press of Kansas. ISBN 9780700620951. Graydon J. Tunstall: Blood on the Snow: The Carpathian Winter War of 1915, University Press of Kansas, Lawrence, 2010. Richard L. DiNardo: Breakthrough: The Gorlice-Tarnow Campaign, Praeger, Santa Barbara, 2010. ^ Buttar, Prit (2014). Collision of Empires. The war on the Eastern Front in 1914. Oxford: Osprey. pp. 110–246. ^ Herwig, Holger L. (1997). The First World War, Germany and Austria-Hungary 1914-1918. London: Arnold. p. 136. ^ Foley, Robert T. (2005). German strategy and the path to Verdun : Erich von Falkenhayn and the development of attrition, 1870-1916. Cambridge University Press. p. 129. ^ DiNardo, Robert L. (2010). 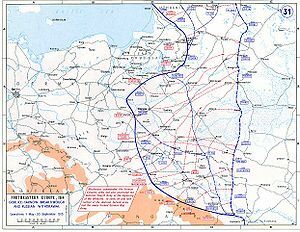 The Gorlice-Tarnow campaign, 1915. Praeger. p. 7. ^ DiNardo, 2010, p. 49. ^ Bittar, Prit (2015). Germany ascendant, The Eastern Front 1915. Oxford: Osprey. p. 173. ^ Foley, 2005, p. 133. ^ Golovine, Nicholas N. (1931). The Russian army in the World War. Oxford. p. 220. ^ Stone, Norman (1998) . The Eastern Front 1914-1917. London: Penguin. pp. 92, 135. ISBN 0140267255. ^ obinson, 2014, p. 233. ^ DiNardo, 2010, p. 62. ^ DiNardo, 2010, p. 75. ^ DiNardo, 2010, p. 99. ^ DiNardo, 2010, pp. 106-107. ^ Robinson, 2014, p. 240. ^ Stone, 1998 ,pp. 165-193.